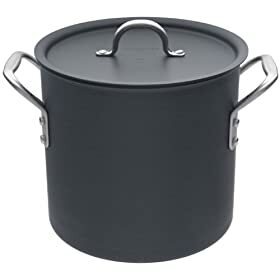 Description: 12 quart Hard Anodized stock pot with lid. Pros: Large with a tight fitting lid. Nice finish and sturdy design. Conclusion: We like to have a lot of pots to use for specific tasks. 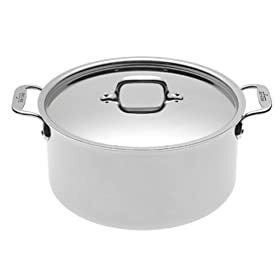 This type of pot, not really useful for braising or the oven, is great for stove-top soups and stocks because of its high sides and relatively narrow form. This model is very nice. We generally like Calphalon's products (except for their knives), they are well made and have a good feel. Name: Rebecca Comment: I would have ordered this if it would have had a price and I didn't feel harassed.